kc bob: At least we have the Jayhawks! 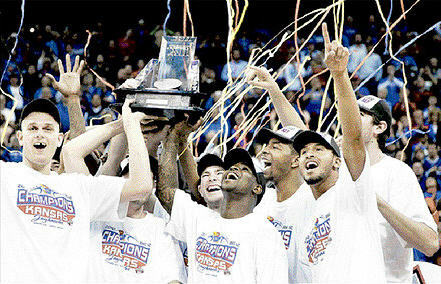 KU players celebrate their 72-64 victory over K-State last night to claim the Big 12 Men's championship. Speaking as a die-hard Durham Bulls fan, I can't WAIT for the season to open.32 days, 4 hours, and 57 minutes to opening day. That was an exciting game. Great defense on both sides. I'm not even a KSU or KU fan. But with all the local hoop-la (Get it? HOOP-la? ), My First Wife and I watched the game.